Brined, herb-roasted Thanksgiving turkey for the holiday. I was never thrilled about turkey at Thanksgiving. One year, I was in charge of the bird and bound and determined I would make it really well. After trying this recipe I feel in love with Thanksgiving turkey and will never do it any other way. It was so moist, everyone loved it. I wish I had some now! For the Brine: Directions To make the brining solution, dissolve the salt and sugar in 2 gallons of cold water in a nonreactive container (such as a clean bucket or large stockpot, or a clean, heavy-duty, food grade plastic storage bag). Note: if you have a big turkey and need more brine than this, use 1/2 cup salt and 1/2 cup brown sugar for every gallon of water. Remove the neck, giblets, and liver from the cavity of the turkey and reserve for the gravy. Rinse the turkey inside and out under cold running water. 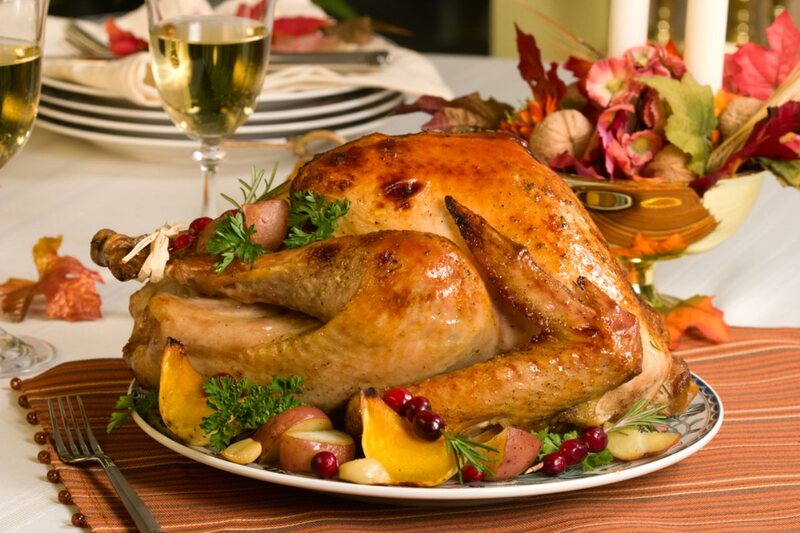 Remove the turkey from the brine and rinse well under cold running water. Pat dry with paper towels both inside and out. Place turkey, breast side up, in a large, heavy roasting pan. Rub breast side with orange segments and rub on all sides with the butter, stuffing some underneath the skin. Season lightly inside and out with salt and pepper. Stuff the turkey with the onion, remaining orange, celery, carrot, bay leaves, thyme, rosemary, sage and parsley. Loosely tie the drumsticks together with kitchen string. Roast the turkey, uncovered, breast side down for 1 hour. Remove from the oven, turn, and baste with 1/2 cup stock. Continue roasting with the breast side up until an instant-read meat thermometer registers 165 degrees F when inserted into the largest section of thigh (avoiding the bone), about 2 3/4 to 3 hours total cooking time. Baste the turkey once every hour with 1/2 to 3/4 cup chicken or turkey stock. Remove from the oven and place on a platter. Tent with aluminum foil and let rest for 20 minutes before carving. For the turkey broth: Heat the oil in a large heavy saucepan over medium-high heat. Add the turkey neck, heart, and gizzard to the pan and saute until just beginning to brown, about 1 minute. Add the chopped vegetables and bay leaf to the pan and saute until soft, about 2 minutes. Pour the stock and 3 cups of water into the pan and bring to a boil. Lower the heat to medium-low and simmer until the stock is reduced to 4 cups, about 1 hour, adding the chopped liver to the pan during the last 15 minutes of cooking. Strain the stock into a clean pot or large measuring cup. Pull the meat off the neck, chop the neck meat and giblets, and set aside. For the pan gravy: Pour the reserved turkey pan juices into a glass-measuring cup and skim off the fat. Place the roasting pan on 2 stovetop burners over medium heat add the pan juice and 1 cup turkey broth and the white wine to the pan, and deglaze the pan, stirring to scrape any brown bits from the bottom of the pan. Add the remaining 3 cup of broth and bring to a simmer, then transfer to a measuring cup. In a large heavy saucepan, melt the butter over medium high heat. Stir in the flour and cook, stirring constantly, to make a light roux. Add the hot stock, whisking constantly, then simmer until thickened, about 10 minutes. Add the reserved neck meat and giblets to the pan and adjust seasoning, to taste, with salt and black pepper. Have a great holiday! Slice and serve guests with desired sides.